Configuration Manager already collects some information about the monitors by default, but it is being extremely stingy about it. This is what ConfigMgr collects out of the box. Only the resolution is really of any worth to us, everything else is useless. Monitors actually advertise quite a bit more about themselves to the computer in the form of the EDID record. They do that so the operating system can display valid resolutions to the user to choose from, but this record also includes some extremely useful data for our inventory, mostly the manufacturer name, the serial number and the manufacturing date. We can run this script with administrator rights on any PC that has physical monitors connected to it. VMs and display-less computers obviously don’t work. 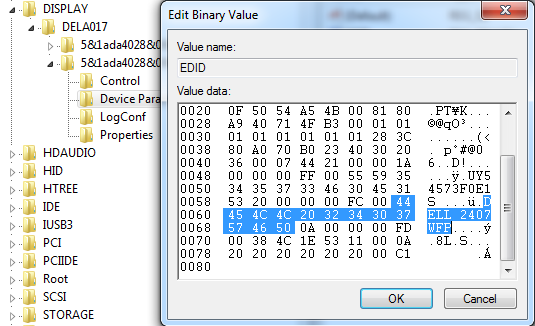 It will parse the binary data in the correct registry key, create a new WMI class if necessary, then fill it with the most useful EDID fields of all currently attached monitors. After the script has been run once, you can query the new WMI class like usual. If you create a package in SCCM with this script and push it out to your PCs you will get a nicely formatted WMI class on all your systems. To make sure that later changes in hardware are correctly recorded you will need to set a repeated deployment schedule – I recommend setting it to the same interval that your hardware inventory runs at. Alternatively you can of course also use Scheduled Tasks to regularly run it. Now that we have our data available in WMI, read part 2 of this guide where I will show you how to collect a custom WMI class in SCCM 2012. 15 Responses to "Collecting monitor serial numbers with SCCM"
I’ve packaged this script in SCCM. When I deploy it on a computer, the WMI class is created (so no ExecutionPolicy problem) but the instace with the informations of the monitors are not… Whereas if I execute the script manually on a computer, instances are populated. Powershell can actually have different execution policies for different users (using the “set-executionpolicy -scope” option). Maybe that is the problem? A good trick to simulate deploying a script is to use psexec from sysinternals ( http://technet.microsoft.com/en-us/sysinternals/bb897553.aspx ) and logon to a computer with that (with “psexec \\computername cmd”). If you do that you are logged on as the SYSTEM account to that computer, so you can attempt to run an installer or script as SYSTEM and find bugs that only show up under that account. Mostly those are because that account doesn’t usually have any rights on network shares or similar but sometimes there are user specific settings too (group policy etc). I put a script copy with some more debug text up at http://exar.ch/files/get-monitor-details.ps1 maybe you can try that one, it will print more useful information on the command line. First off, thank-you for the script! It helps fill a void I was facing. Just a bit more information… when I run wbemtest.exe I can see the class and the instances for each of my two monitors. The properties of the class are all empty (null to be exact), while the instances are populated with the correct information for my two monitors. I have also verified that the tables have been created in my ConfigMgr database, but they are empty. So it appears that the powershell script created the WMI class, and populated it, properly and the ConfigMgr HW Inv has been properly been configured but the data is not being stored in the database. Is my hardware inventory not configured properly to gather the information from the instances? Why else would the WMI class and the tables within my ConfigMgr database have been created? Thanks for any help! I was hoping to gather this info this weekend and provide a report early next week. The script and your video for creating the report with the data were extremely helpful! Hello. Is someone looking how can we collect Dell monitor serial tag (not serial number) at same technical? I am getting an error ” could not create wmi class ” any idea! You’re probably not running it as administrator. Thanks for your reply. I am running with admin right for sure. Here is the command I run and get this…..
That sounds more like a problem with WinRM on the target computer. Try if you can do “enter-pssession” to it, otherwise you need to fix WinRM. I thought so as well but was not sure. Yes I can not use “Enter-PSSession” either and having to run the scripts on remote all machine. Do you know how to fix WinRM issue? Dell on the other hand shows DEL correctly on both.